Designed by a true artist to create a unique gift for your recipient this spring season, this flower bouquet is set to make a memory. 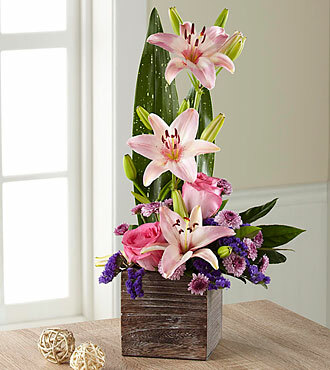 Stems of pink Asiatic Lilies bloom with multiple flowers creating height and interest with pink bi-colored roses, lavender button poms, purple statice, and lush tropical leaves at the base. Presented in a square wooden planter to give it a natural, rustic look that offsets the elegance of this exquisite design, this flower arrangement has been designed for you to help you celebrate a birthday, Mothers Day, or Easter.